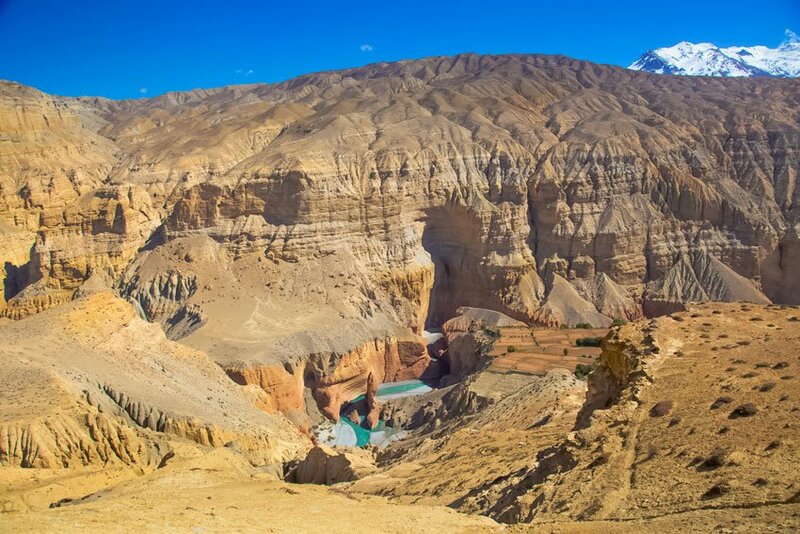 Upper mustang trek will be your great experience. 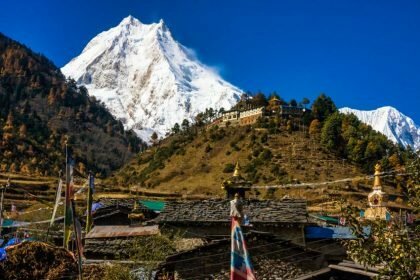 UM lies in the north of Dhaulagiri and Annapurna massif. It is a heavenly spot situated at the Mustang district of Dhawalagiri Zone in Nepal. This area is also widely known as little Tibet. Mainly because geographically it is connected within Tibetan plateau. Moreover, the cultural and tradition of the people who are inhabitant of this tiny former forbidden kingdom are influence by Tibetan lifestyle. This place was exposed to foreigner adventurers mainly around 24 years ago by government of Nepal. Before 1992 AD, It was highly restricted to outlanders. It is on historical salt trading route between Nepal and Tibet. “Upper mustang” is actually, properly protected for the culture and religious beliefs and was also reigned till 2008 by the local king Jigme Dorje Palbar Bista, who passed away in 2016. Jigme was succession of former warrior Ame Pal, who founded this tiny Buddhist kingdom in 13th century. There were few local kingdom, which was already annexed by Nepal in 18th century. Though kings of small kingdom has given respect as local king. The system of king and feudalism came to end, when Nepal was declared as Republic country on October 2008. In terms of tourism, Trans-Himalayan mustang region is one of the perfect trekking destination in the world. And is quite famous for its cultural and natural beauties. It can be divided into two parts, south part as lower and north part as Upper Mustang Trek. Once, northern part was the ancient kingdom of Lo, and Lo-Manthang was its capital. Till now the lifestyle, culture and tradition seems to have remained unchanged being isolated for 1000s of yrs. The ancient historical background of this place is attentive in legend and mystery. Ancient capital called Lo Manthang is now village development committee. Currently, Jomsom is headquarter of this district. 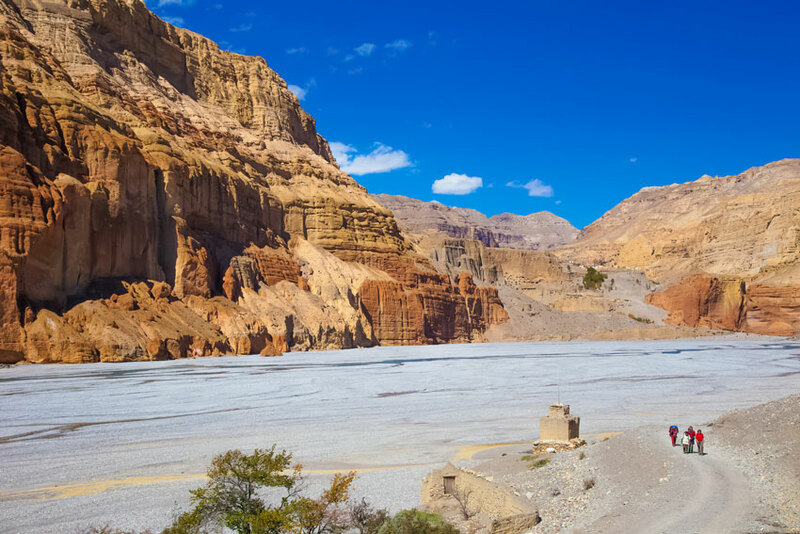 If you are the student of history and archeology, Upper mustang trek will be the great choice. Peoples and Religion in Upper Mustang Region. Day 1: Kathmandu (1400 m (4600 ft) to Pokhara (850 m (2,789 ft.)): 6 hrs drive. Day 2: Pokhara to Jomsom (2744 m (9002 ft) & Kagbeni (2882 m (9456 ft): 20 min flight and 4 hrs walk. Day 3: Kagbeni to Chele (3050 m (10,004 ft): 5-6 hrs. Day 4: Chele to Syangboche (3475 m (11,398 ft): 6-7 hrs. Day 5: Syanbochen to Ghaymi (3520 m (11,548 ft): 5-6 hrs. Day 6: Ghaymi to Tsarang (3500 m (11,480 ft): 4-5 hrs. Day 7: Charang to Lo Manthang (3840 m (12598 ft): 5-6 hrs. Day 9: Lo Mangthang to Drakmar (3810 m (12,500 ft): 6-7 hrs. Day 10: Drakmar to Ghiling (3806 m (12,484 ft): 5-6 hrs. 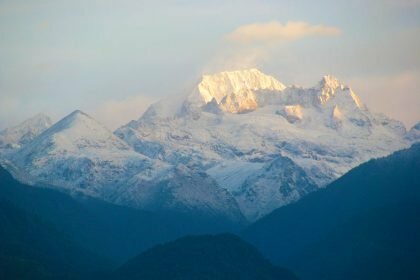 Day 11: Ghiling to Chhusang (3,050 m (10,004 ft): 5-6 hrs. Day 12: Chhusang to Jomsom (2744 m (9002 ft): 6-7 hrs. Day 13: Jomsom to Pokhara (850 m (2,789 ft)): 20 minutes flight. Day 14: Pokhara to Kathmandu (1400 m (4600 ft): drive 6 hrs or 25 min flight. Except winter season in Nepal, other seasons are perfect for trekking in Mustang. Spring, autumn, summer (monsoon) and winter are the 4 main seasons in Nepal. 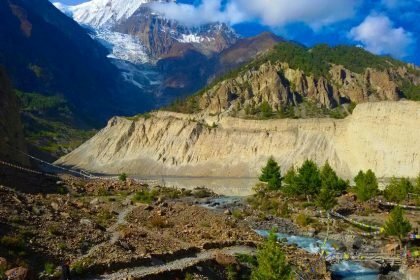 Many trekking route are simply not favorable at monsoon period, being rain-shadow area of Mount Annapurna and Dhaulagiri range, upper mustang trek can be done during summer time too. Pre-monsoon season is one of the best opportunity to explore the big events called “Tiji festival” of upper-mustangis people. Probably the biggest festivals of entire district and remains up to 3 days. In winter time, the nighttime temperature range drops as low as (-23) to (-26) ° C. So, only few people remains over there to look after the cattle and homes. 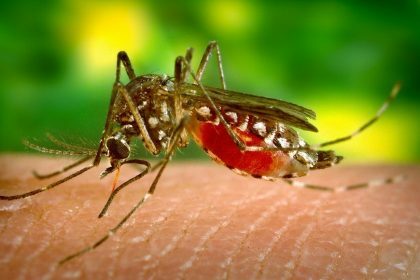 Majority of hotels remain closed and masses start to descend lower zone. It is not recommended to do trekking in wintertime. Anyway you are hearty welcomed in any other seasons. You may also like best time to visit Nepal and know about average price or cost need for U.Mustang Trek. Geographically “Lo” is 2/3 (two third) of Mustang. In which 1/3 (one third) are part of the southern area of Thak Khola. The people in Mustang are also known as Lopa or Lobas, this indicates ‘people of Lo’. Mainly, Gurung, Thakali and Bista are the main inhabitants. Same as Tibet, Mustang is rich in Buddhist culture and tradition. Earlier, Salt trade with Tibet was the main occupation, and now tourism and animal farming is the major income sources of people. The whole small town is enclosed by huge walls on each side. Moreover it is also recognized by city of wall. 1000 eons of ancient monastery, mysterious caves, tunnels, local tribes with picturesque beauties of the diverse landscapes. Lo-Manthang Area that passes via bumpy trail up and down slope, vegetation-less terrain and awesome outlook of Annapurna, Nilgiri, Dhaulagiri with additional peaks. Houses made of sun backed bricks. Walled city called Lo-manthang and local king’s Palace. Horse racing Tiji Festival. For this events, you should reserve ahead simply because there are very few hotels in Lo Mangthang. Ways of living, Custom and tradition are still unspoiled. 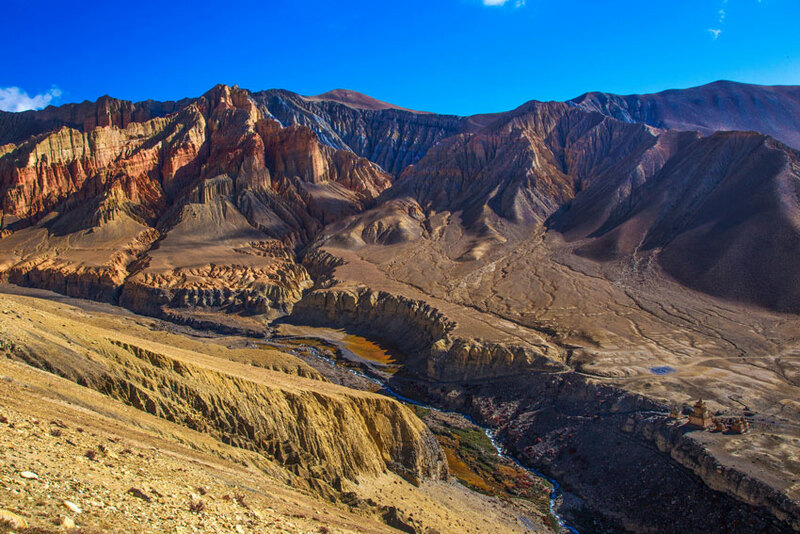 Upper Mustang trek is also known as alternative to Tibet treks. Because features of landscape, ethnic culture and people are almost solely to Tibet. Note: At present, nonnative are allowed to enter Upper-Mustang, only after they own a special permit of US $500 for 10 days, and the tours is only arranged by government certified trekking companies of Nepal. According to the government rule, to acquire the permit, minimal a guide for 2 trekkers is compulsory. 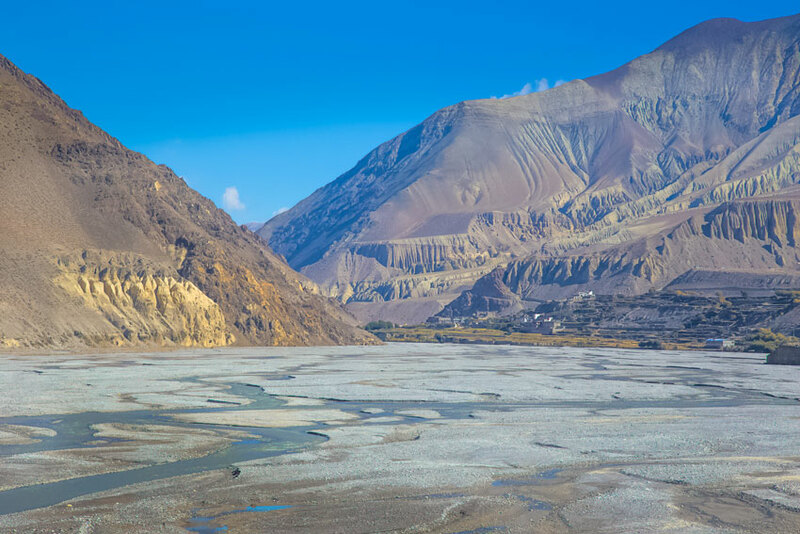 You can’t trek Upper Mustang lonely or on your own way without a guide. You don’t need to worry, because all this kinds of stuff are well managed from certified travel agencies or companies. Caution: Be careful that, whenever you book your trip, you must know about the company, it is certified by government or not. Before moving for Upper mustang trek, we have to be prepared for it. Before starting your journey, change the foreign currency in places like Kathmandu and Pokhara. The trekking destination are usually in rural area and are isolated. This place remain cold every year. So, pack and carry your necessary stuff like clothes, medic-kit along with you. Tented camp or teahouse is yours choice. Initially, our trail touch riverbank of Kaligandaki River. Take a domestic flight or road drive to Lake City Pokhara. It takes around 25 min from airways and or 6 hours by drive. On the way we appreciate the views of greenery hills, villages and Trisuli River which is one of the best watercourse for rafting. Those people who visit Pokhra, definitely they do like this wonderful city. 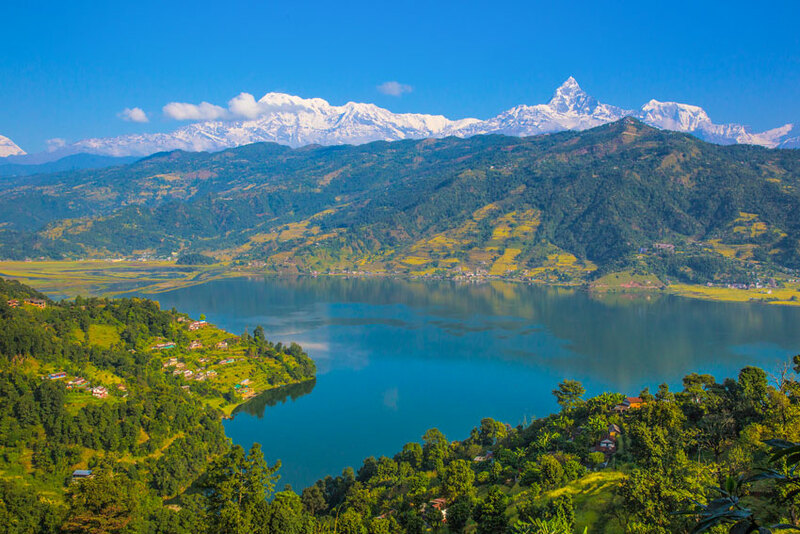 After arriving Pokhara you can take a brief sightseeing around like Fewa Lake, Davis fall and so on. Overnight rest in lodge. We have two option here, one is recently opened roadways and airways. But roadway seems bumpier and takes time too. Because still it is on under-construction, so better choose airways. 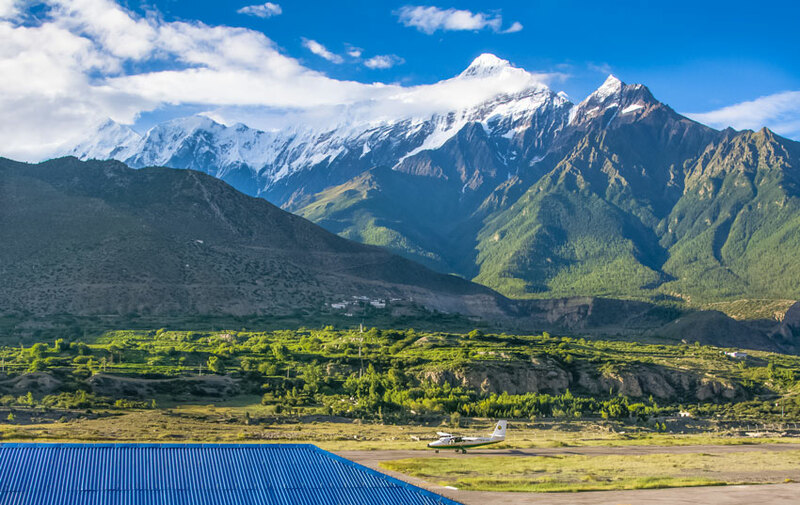 Early in the morning we take a flight for Jomsom from Pokhara air-port and stroll towards Kag-beni via Ekle Bhatti. While on a kind of brief mountain flight you will experience the huge massifs of beyond 8000 m (26247 ft). We take a lunch at Kagbeni, which is also known as gateway to Upper Mustang trek. After having lunch, lets move around this beautiful tradition village. Remember that air flights only operate in the morning time, because it starts to get too windy after 12 am in Jomsom. After having entry permit formalities on checkpoint, we move on to Chele. Today, the track traces moderately up and down almost entirely. On the way we can see the good views of village, valley, Nilgiri and windy and sandy terrain of cold desert. First we encounter a village called Tangbe, here we can see white and red colored houses, caves etc. have a lunch here or we can trek one and half hour forward to Chhusang. Furthermore we move and cross the Kaligandaki river valley and head upward towards Chele. Now you can see and feel the different culture too. After having morning meal, we continue our trek to Upper Mustang, Simply former kingdom of Lo. 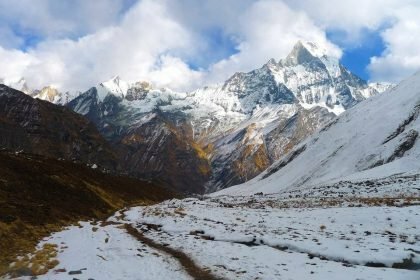 Initially, we stroll for Eklo Bhatti and climb a long steep to Taklam La Pass (3,624 m), from here we can get the views of Damodar Danda, Tilicho Peak and Yakawa Kang. Now again we descend for another beautiful spot called Samar village. Depending on our pace, commonly it may takes 3 to 4 hrs to reach Syangboche from Samar. En route, we cross by Ram-chung cave and juniper woodland. Today we climb up gradually to the Yamda La pass of 3800 m (12,467 ft) with magical vistas of mountain range and wind eroded canyons. Moreover, we passes through barley fields and small community in the trail, which are commonly influenced by Tibetan style. Next, again we have to pass the most challenging Nyi La Pass of (4,010 m (13,193 ft). 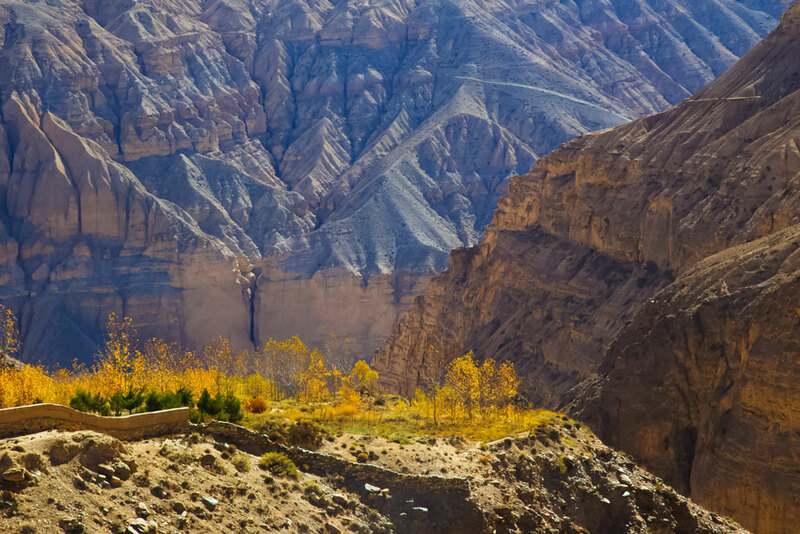 It is the most difficult and highest mountain pass of the entire upper mustang trekking trail. But the beautiful surroundings around us, will not let us to feel difficulty. From the peak of Nyi La, we have to begin with descending downwards for our quarter final destination called Ghaymi. It is also a third largest village in Lo. 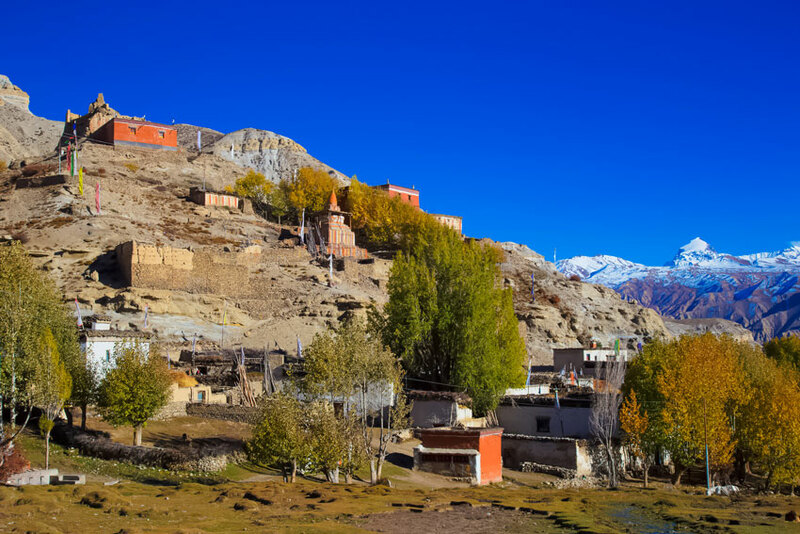 Chortens, Old monastery and mani stone walls are the main honor of this tiny ancient village. Flora are rarely found in this entire district but vegetation like potatoes and barley are cultivated by local people around their settlements. About half an hour trek from Ghaymi, we will discover the longest historic mani walls of Mustang, a stone carved with sacred mantra by Buddhism followers. The track is comfortable today. This track signifies the myth and historical past of the holy person Padmasambhava, who was a founder of Tibetan Buddhism. Because of today’s short trek, we have a lots of time to explore the main attraction of Tsarang village like collections of sculptures and Thankas paintings of seated Buddha’s, Gompas etc. From a mani stone point, the trail leads us to eastern side for Tsarang village. When you will notice a huge white dzong and red gompa, which indicates you are at Charang (Tsarang) village. Today our dreams will come true, because we will reach the main destination of our entire Upper mustang trek. Our journey will begin with down-hill trail to the Charang chu canyon. After passing the river we will then start off our ascent to the pass of Lo, at the height of 3850 m (12631 ft). 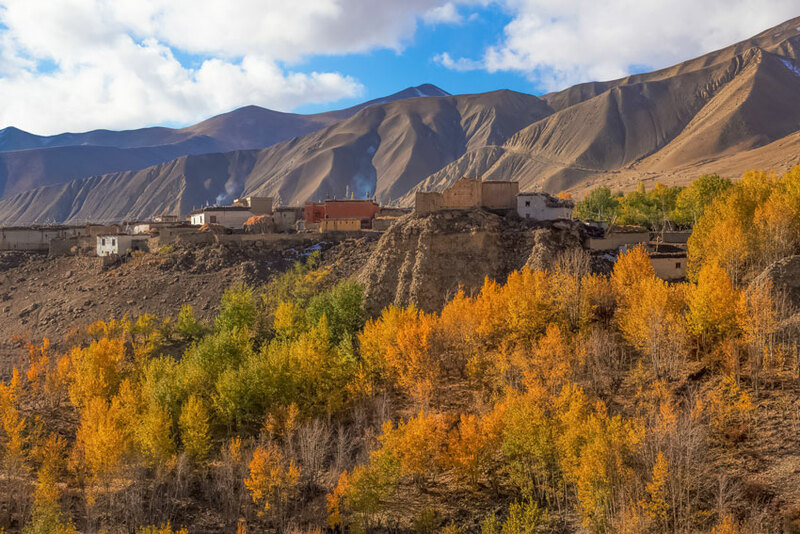 From the topmost part of the pass, we can see the walled city of ancient Lo kingdom, known as Lo – Manthang. 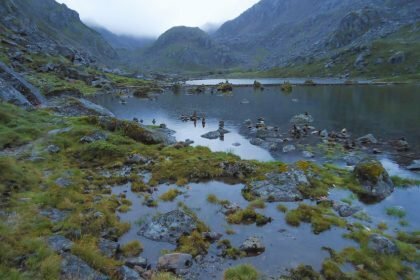 We now go down for a while, cross the stream and then rise to a place where the former capital lies at 3840 m (12598 ft). 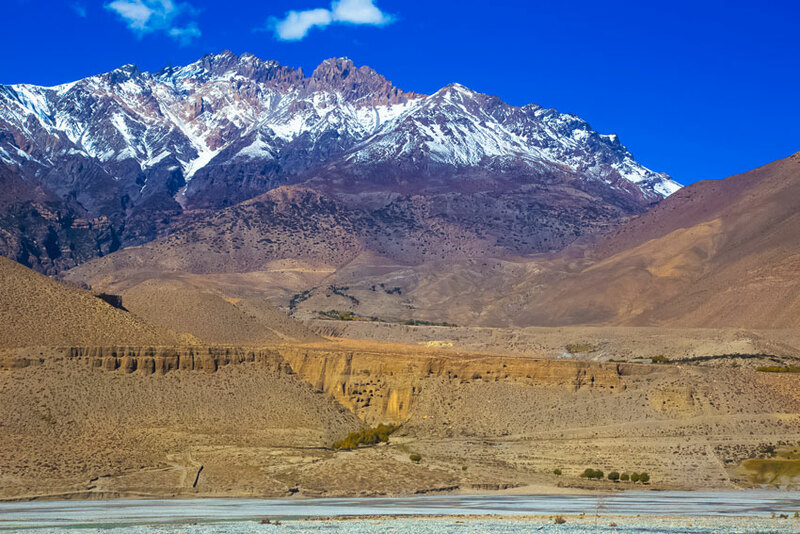 Today is the best time and opportunity to explore the main attractions of Upper Mustang trek. There are multitude of options are available for sightseeing. The city contain 4 major ancient monasteries and around 150 houses which are used by local people and lamas. Here, you will notice the culture, customs and tradition of the people. We will start by visiting some historic monasteries around this ancient city like Namgyal Gompa is one of them. This gompa is also known for local court. Next you will stroll for Tingkhar village, it is a small community of 40 houses in north-west side of Lomanthang. Moreover, shouldn’t forget to take a glimpse of royal palace, it is also one of the major highlight of this area. Nearby the area of Lo, there is a mysterious place called Chhosar, at that place you can explore the Nyphu monastery and ancient cave settlements of 2500 years old. Those caves are amazing and looks like a steep cliff but strange things is that inside it there are 40 rooms with floor. You can go via Jeep or Horse riding from Lomanthang. Remember that the itinerary are customizable in some company, so before traveling tell them to customize your trip for Chhosar too, it is very incredible and mystical place. Note: Depending on your fitness, you may not able to explore whole things in single day. So if you want to extend your stay over here, better talk with your guide or travel company. Remember that strong windy environment at late afternoon is common in Upper mustang. Today is our returning day. As opposed to returning through the exact same way, it is much better to carry another track. So we follow a new path, climb to the Chogo-La pass 4326 m (14193 ft). And again descend to the most ancient cloister in Nepal (probably in the world) known as Ghar Gompa (Lo-Gekar monastery). Which was built on around 8th century by monk Guru Rinpoche. It is believed that, if you ask for something in this monastery, the wish will be fulfilled. Still the views of mountains and beautiful landscape is unbelievable. Next, from Ghar Gumba we rise to a ridge and go down for stunning Drakmar village. After having breakfast, basically today we are going to be walking for long period almost 5 to 6 hours. Since, there are no any settlements or simply teahouses between Drakmar and Ghiling. Anyway the scenic views of landscape and huge mountains will be our best friends. Better we approach there before the strong dusty wind hit us, as I already quoted that afternoon is often windy period in Upper Mustang region. After arrival we take rest for a while and move around Ghilling village at evening time. We trace back our trail for Chusang along with the riverbank of Kaligandaki River and with beautiful views. You know that while moving from Kagbeni to Chele, we already had crossed this spot. Chhusang is also spelled as Chuksang, famous for its apple orchard. 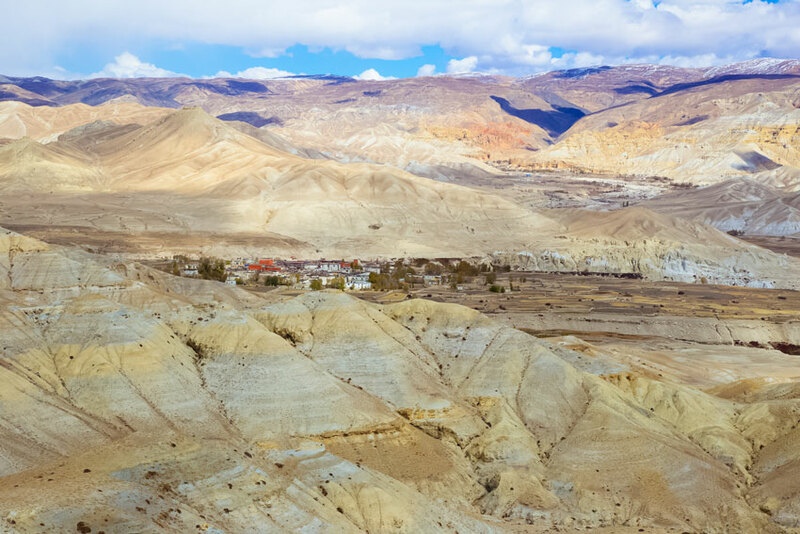 Today is the final day of our Upper mustang trek. After having morning meals, we head towards Kagbeni checkpost, it takes around 3 hrs to reach and we must have to make an exit entry on check-post. Otherwise we have to pay extra fine. We take a lunch up here and again move onward for Jomsom via the bank of Kaligandaki River. Simply, now we are on the trail of Annapurna Circuit trek. We stay tonight nearby Jomsom airport. After having breakfast, we check in domestic air-port for a flight to Pokhara. After a scenic short mountain flight of 20 minutes, we arrive at Pokhara-airport. Today whole days is ours, lets have a sightseeing or take a rest at Hotel. There are numerous of visiting spots around the Pokhra valley like Tibetan refugee camp, Devi’s falls, lake side, Gupteshwor cave and so on. Choice is yours, drive or flight. If you are feeling tired, better choose flight. Wanna view greeny landscape and villages? Just choose to drive. After our arrival at Kathmandu, we can celebrate our successful Upper Mustang trek. Remember that Kathmandu is also spelled as KTM on short form. 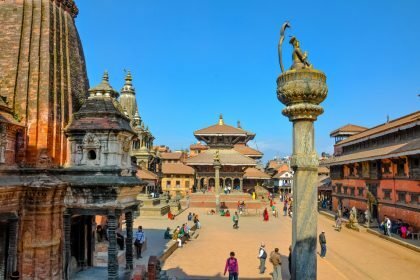 There are many spot for sightseeing around valley like Pashupati Nath temple, Swayambhu, Changu Narayan, Patan and Bhakatapur Durbar Square are some of the major highlight. Though it looks chaos city, it holds many hidden treasure, which are recorded as UNESCO world heritage site. 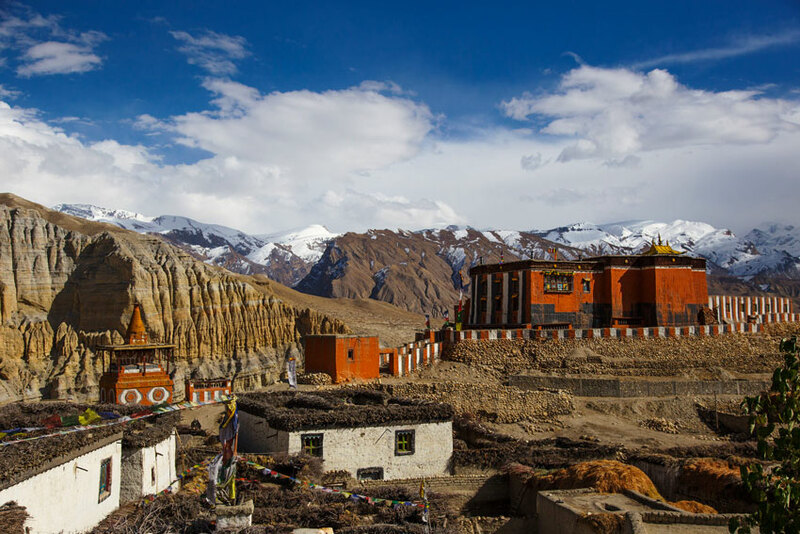 Upper Mustang trek, can be the most preferred trekking destinations for the traveller who wants to check out historic monasteries, culture, tradition and also caverns in an isolated area along with eye-catching landscape. The trekking trails are moderate in difficulty. For being restricted area we need a special permit from government of Nepal. The permit cost $500 for 10 days and if you wants to stay more than 10 days, you have to pay extra $50 for each day. This wonderful place will not allow us to feel regret in terms of money or anything else.